If Igor Stravinsky, the influential 20th century Russian, French, and American composer, is known for one thing, it is his stylistic diversity. From Russian ballets to Tchaikovsky-influenced neoclassical music to a serial rhythmic manipulation unique to his own, Stravinsky wrote music outside the conventional norms of the time. 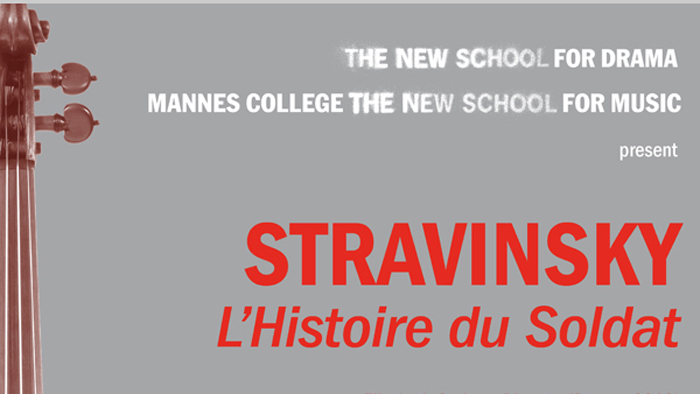 Drawing on the composer’s revolutionary spirit, musicians from Mannes College The New School for Music will team up with actors from The New School for Drama for a festival concert, “The Rise of Modernism: L’Histoire du Soldat” on Friday, November 30 at 6:00 p.m. Though this masterpiece is frequently played across the world, Drama students will add an additional layer by staging the performance, bringing to life the classic parable. L’Histoire du Soldat, translated as “The Soldier’s Tale,” is a 1918 theatrical work written as a multilayered performance to be read, acted, played, and danced. The story behind the music, written in French by the Swiss writer C.F. Ramuz, depicts a soldier who trades his violin to the devil in exchange for a book that predicts the future of the economy. The narrated version is very rarely performed, marking this production a unique experience. Held at Tishman Auditorium at 66 West 12th street between Fifth and Sixth Avenues, the concert is free and open to the public. Seating is first-come first-served. For box office and more information call 212.580.0210 x4817.